A dramatic late goal for Birmingham at Bolton condemned Doncaster to relegation from the Championship. Despite being 1-0 down at Leicester, Rovers were set for survival until Paul Caddis made it 2-2 for Blues in stoppage time at the Reebok Stadium. Although both teams finished level on points, Rovers go down because of an inferior goal difference. David Nugent scored the only goal for the champions from the spot after James Husband fouled Riyad Mahrez. That came in the 75th minute, just before Bolton doubled their lead over Birmingham. At that moment, Doncaster were a point clear of Birmingham. But late efforts from Nikola Zigic and Caddis ensured that it would be the Yorkshire side who would be returning to League One after one season back in the Championship. The visitors rarely threatened the Leicester goal, with Nigel Pearson's side creating the only clear-cut chances in the match. Nugent should have done better with the Foxes's first opportunity when Danny Drinkwater found him with a brilliant through-ball. The former Preston and Portsmouth player had only Sam Johnstone to beat, but the Rovers goalkeeper guessed correctly when the striker tried to place his shot. Nugent was again denied by Johnstone moments later. This time his snap-shot from a corner was pushed away by the keeper, diving low to his left. Rovers' only shot that tested Kasper Schmeichel came after the break when Gabriel Tamas strode forward before launching a low drive that the Danish keeper easily saved. Before the goal, the biggest cheer at the King Power Stadium was for striker Kevin Phillips, who retired from football after a 20-year career when he was substituted. The 40-year-old, who helped five clubs win promotion to the Premier League, will now join the Leicester's coaching staff. The Foxes deservedly took the lead soon after when Mahrez appeared to be clipped by full-back Husband as he ran into the area. Nugent stepped up for the penalty and smashed his effort high past Johnstone for his 22nd of the season. With just seconds remaining news filtered through that Birmingham had equalised at Bolton, however Rovers barely had time to react. As for Leicester, they ended their remarkable season with 102 points - only the 11th team to break the 100-point mark in the second tier of English football. Leicester manager Nigel Pearson: "For us to go out there and finish in front of our own fans with a positive result and become one of the few sides to go beyond 100 points, is a great achievement. "People talk about us romping to the title. But it hasn't always been that. We have had to work hard. "Clearly for us the next step for this club's development is to try and establish ourselves as a Premier League side." Match ends, Leicester City 1, Doncaster Rovers 0. 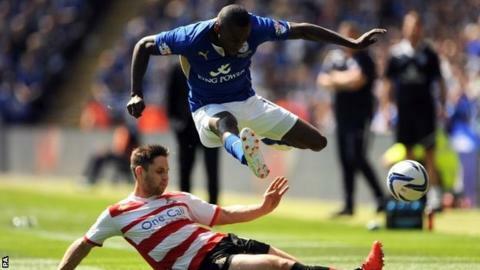 Second Half ends, Leicester City 1, Doncaster Rovers 0. Attempt missed. Riyad Mahrez (Leicester City) left footed shot from the right side of the box is close, but misses the top left corner. Assisted by Marcin Wasilewski. Attempt blocked. Harry Forrester (Doncaster Rovers) left footed shot from outside the box is blocked. Attempt missed. Anthony Knockaert (Leicester City) left footed shot from the left side of the box misses to the right. Attempt saved. Riyad Mahrez (Leicester City) left footed shot from outside the box is saved in the centre of the goal. Assisted by Paul Konchesky. Riyad Mahrez (Leicester City) wins a free kick on the right wing. Foul by Enda Stevens (Doncaster Rovers). Corner, Doncaster Rovers. Conceded by Wes Morgan. Attempt blocked. Harry Forrester (Doncaster Rovers) right footed shot from outside the box is blocked. Assisted by Paul Keegan. Wes Morgan (Leicester City) wins a free kick in the defensive half. Foul by Harry Forrester (Doncaster Rovers). Attempt missed. Billy Sharp (Doncaster Rovers) header from the centre of the box is high and wide to the left. Assisted by David Cotterill with a cross following a set piece situation. Foul by Anthony Knockaert (Leicester City). Gabriel Tamas (Doncaster Rovers) wins a free kick on the right wing. Foul by David Nugent (Leicester City). Gabriel Tamas (Doncaster Rovers) wins a free kick in the defensive half. Attempt missed. Riyad Mahrez (Leicester City) left footed shot from outside the box misses to the left. Assisted by Kasper Schmeichel. Attempt saved. Billy Sharp (Doncaster Rovers) header from the left side of the box is saved in the top centre of the goal. Assisted by David Cotterill with a cross. Foul by Paul Konchesky (Leicester City). Harry Forrester (Doncaster Rovers) wins a free kick on the right wing. Substitution, Doncaster Rovers. Billy Sharp replaces Dean Furman. Substitution, Doncaster Rovers. Harry Forrester replaces Lucas Neill. Foul by Wes Morgan (Leicester City). Chris Brown (Doncaster Rovers) wins a free kick in the defensive half. Attempt blocked. David Nugent (Leicester City) right footed shot from the left side of the box is blocked. Assisted by Anthony Knockaert with a cross. Corner, Leicester City. Conceded by Sam Johnstone. Attempt saved. Anthony Knockaert (Leicester City) left footed shot from the centre of the box is saved in the bottom left corner. Assisted by Paul Konchesky. Substitution, Doncaster Rovers. Enda Stevens replaces James Husband. Substitution, Leicester City. Dean Hammond replaces Andy King. Attempt missed. Anthony Knockaert (Leicester City) left footed shot from outside the box is too high. Assisted by Riyad Mahrez. Attempt missed. Paul Keegan (Doncaster Rovers) left footed shot from the right side of the box is high and wide to the left. Assisted by David Cotterill. Substitution, Leicester City. Gary Taylor-Fletcher replaces Lloyd Dyer. Goal! Leicester City 1, Doncaster Rovers 0. David Nugent (Leicester City) converts the penalty with a right footed shot to the centre of the goal. Penalty Leicester City. Riyad Mahrez draws a foul in the penalty area. Penalty conceded by James Husband (Doncaster Rovers) after a foul in the penalty area. Attempt blocked. Anthony Knockaert (Leicester City) right footed shot from outside the box is blocked. Assisted by Andy King. Attempt saved. David Nugent (Leicester City) left footed shot from the left side of the box is saved in the bottom right corner. Assisted by Anthony Knockaert. Attempt saved. Riyad Mahrez (Leicester City) left footed shot from outside the box is saved in the centre of the goal. Assisted by Daniel Drinkwater. Corner, Leicester City. Conceded by Paul Quinn.